A collection of twelve stories written by Sir Arthur Conan Doyle that feature his most famous detective -Sherlock Holmes. 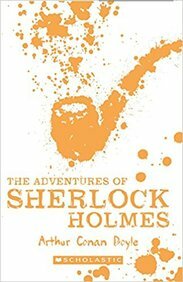 Join Sherlock and his assistant Dr. Watson, as they investigate everything from blackmailed kings in the Adventures of a Scandal in Bohemia, to bank robberies in the Adventure of the Red-Headed League and disappearing brides in the Adventure of the Noble Bachelor. Additional stories include, the Adventure of a Case of Identity, the Adventure of the Boscombe Valley Mystery, the Adventure of the Five Orange Pips, the Adventure of the Man with the Twisted Lip, the Adventure of the Blue Carbuncle, the Adventure of the Speckled Band, the Adventure of the Engineers Thumb, the Adventure of the Beryl Coronet, the Adventure of the Copper Beeches.